Tue, Oct 16, 2018, 09:49 pm SL Time, ColomboPage News Desk, Sri Lanka. 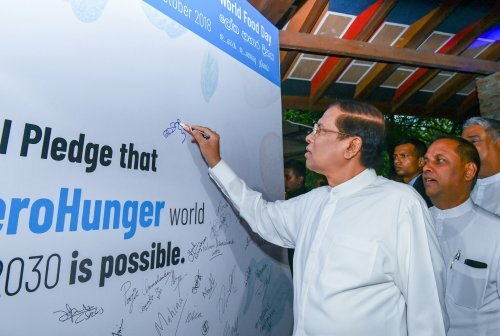 Oct 16, Colombo: Sri Lankan President Maithripala Sirisena today reaffirmed his government's commitment to end all forms of malnutrition in the country and achieve 'Zero Hunger' by 2030. 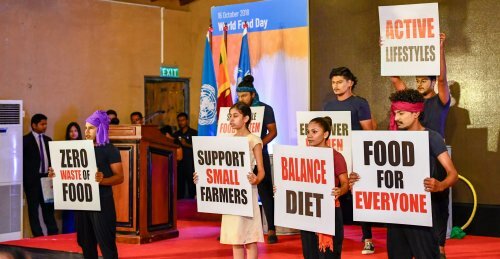 Addressing the ceremony held to mark the World Food Day at the Bandaranaike Memorial International Conference Hall today (16), President Sirisena said that it is important to implement a state policy regarding the production, security, quality and standards of food. The World Food Day is marked on 16th of October every year to celebrate the establishment of the World Food and Agriculture organization by the United Nations. This year it is celebrated under the theme "Our Actions-Our Future 2030". President Sirisena, pointed out that although Sri Lanka, with a long history of food production as an agriculture based country, can be self-sustained with food, a substantial portion of the crops and cultivations are destroyed or lost. He explained that one-third of the crops are being destroyed by animal and cultivations are often being destroyed by the droughts and floods emerging from severe climatic conditions. Therefore, a regular program should be implemented in order to protect the crops getting wasted, the President said. President Sirisena also appreciated the contribution made by the United Nations Food and Agriculture Organization (FAO) to Sri Lanka. The President also presented awards to the students who were the winners of the competitions held to mark the World Food Day. 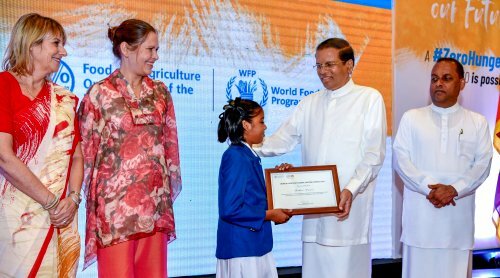 Minister of Agriculture Mahinda Amaraweera, Deputy Minister of Health, Nutrition and Indigenous Medicine Faisal Cassim, WFP Country Director Ms. Brenda Barton, and FAO country representative Nina Brandstrup, were present at the event.